How Revolutionary Was the Munich Congress? What took place at the 1960 Munich Congress can be described as the first “mega-Mass” in History. Whereas previous events of this nature were characterized by solemnity, pomp and sacrality, as befitting the homage due to the Blessed Sacrament, (1) the main emphasis in Munich was on the people present. Inter-religious “dialogue” at the Congress was organized by Germany’s largest ecumenical group, the Una Sancta Movement. Books published by the Movement containing articles written by members of different religions, (13) all emphasizing their supposedly “common vision” were distributed free of charge among the crowds. Lectures were held at Munich University on theological topics. It was noted that Protestant theologians were invited to expound their Eucharistic theology to Catholic audiences. (14) But no apologists for Catholic orthodoxy were in evidence. Jungmann, however, wanted to put an end to it. It seems that he was ashamed of the very existence of Catholicism itself. Having been born and brought up in Bavaria, Pope Benedict XVI had been steeped in the very quintessence of Catholic devotion, especially to the Holy Eucharist. It is well known that he has expressed misgivings about certain developments in liturgical reform, but always with a note of ambivalence. For example, in 2008 he gave a talk on the subject of large outdoor Masses which, he said, continued to pose “an important problem” in the Church. (24) In it, he recalled the 1960 Munich Congress and referred to the “great liturgist” Professor Jungmann, who had revolutionized the event. He did not mention, however, that Jungmann was the driving-force behind a co-ordinated international effort to destroy by stealth both the Church’s traditional liturgy and the popular devotions dear to the heart of every traditional Catholic. 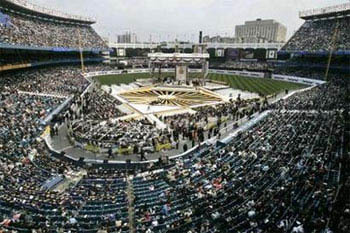 Pope Benedict's mega-Mass at Yankee Stadium on his visit to the U.S. But “mega-Masses” – in which the Blessed Sacrament was routinely exposed to varying degrees of profanation and sometimes outright sacrilege – were a frequent occurrence during Pope Benedict’s papacy. By celebrating them himself, he has provided a major boost to the desacralization of the liturgy, which he purports to deplore. This has helped fuel the popular belief that disrespect towards the Eucharist is now so widespread – and has even been allowed by the Pope – that it would be unthinkable to correct it. If, as he has declared, the “ecclesial crisis in which we find ourselves today depends in great part upon the collapse of the liturgy,” (27) and given his early enthusiastic approval for the “mega-Mass,” it is hard to avoid the conclusion that he has blundered into a crisis partly of his own making. In his explanation of the meaning of an International Eucharistic Congress, Archbishop Piero Marini specifically stated that it “is not a triumphalistic manifestation of faith, a great act of homage shown to the Eucharist … but a service to the continuing journey of God’s People.” He defined it as “the source and summit of the life and activity of all the baptised.” The Shape, Significance and Ecclesial Impact of Eucharistic Congresses, June 9, 2009. Peter Pfister (Ed. ), Gemeinschaft erleben – Eucharistie feiern Der Eucharistische Weltkongress 1960 in München, (Experience Community. Celebrate the Eucharist. 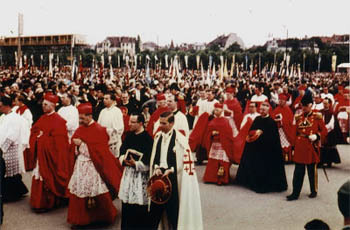 The International Eucharistic Congress in Munich 1960), Regensburg: Archives of the Archdiocese of Munich and Freising, 2010, p. 45. See here.
. The Archives also show that Fr. Joseph Ratzinger gave a sermon on the Mass in the church of St. Maria Thalkirchen, Munich, on August 4, 1960. It was entitled “Liebesmahl und Liebeswerk” (The Meal of Love and the Work of Love). “Damit ist der Eucharistische Kongress von München zu einem Markstein der liturgischen und theologischen Entwicklung geworden, wegweisend für die ganze Kirche.” (Thus, the Eucharistic Congress of Munich became a Milestone in liturgical and theological development, revolutionary for the whole Church.) Fr. Joseph Ratzinger, The Catholic Academy of Bavaria, Der Eucharistische Weltkongress in MünchenErinnerung, Reflexion, Auftrag (The International Congress in Munich 50 Years Ago, Reminiscence, Reflection, Mission), July 20, 2012, p. 12. 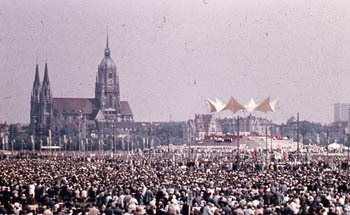 The Congress Masses took the form of the German Betsingmesse, a service invented by Fr. Pius Parsch in the 1920s, in which the people sang the Ordinary of the Mass in the vernacular and sometimes the Propers as well. Fr. Placid Jordan, OSB, “One Million Voices Join in Te Deum at Congress.”, The Bulletin, Official Newspaper of the Diocese of Savannah, August 20, 1960. See here. Cited in Marie-Dominique Chenu, Vatican II Notebook: A Council Journal 1962-1963, trans. by Paul Philibert, OP, Casemate Publishers, 2015, p. 19. Card. Wendel had hosted the Second German Liturgical Congress that took place in Munich from August 29 to September 1, 1955, at which many liturgists, including Jungmann, gave lectures to promote the Liturgical Movement. At that Congress, there was Mass facing the people and “active participation” of the people in the Offertory, congregational singing and spoken responses. See Sylvester Thiesen, “Liturgists at Munich,” The Tablet, September 17, 1955. Cited in Marie-Dominique Chenu, Vatican II Notebook: A Council Journal 1962-1963, translated by Paul Philibert, OP, Casemate Publishers, 2015, p. 19. According to the Cardinal, the point of the Congress was “für ein neues München” (for a new Munich) in which the Church and the world would be renewed. Silvesterpredigt 1956 Seiner Eminenz des Hochwürdigsten Herrn Kardinals im Dom zu Unserer lieben Frau (New Year’s Eve Sermon of His Eminence the Most Reverend Cardinal in the Cathedral of Our Lady; cited in Franz Xaver Bischof, ‘München als Treffpunkt der Kirche: Der 37. Eucharistische Weltkongress 1960’ (Munich as the Meeting Point of the Church: the 37th International Eucharistic Congress), Münchener Theologische Zeitschrift (The Munich Theological Journal), 62, 2011, p. 104. Ecumenism in Germany, which started as a Protestant movement in the early 20th century, was strengthened between the two World Wars when Catholics and Protestants joined forces to combat the rise of National Socialism. In 1943, the German Episcopal Conference set up a department for ecumenical affairs headed by Archbishop (later Cardinal) Jaeger of Paderborn with Karl Rahner and Romano Guardini among its members. Immediately after the War, ecumenical groups mushroomed all over the country, the largest being the Una Sancta Movement created in 1948 by a Catholic priest, Fr. Max Metzger. Archbishop Jaeger collaborated in 1946 with the Lutheran pastor Wilhelm Stählin to found the “Jaeger-Stählin Circle” for prayer and discussion among Protestant and Catholic theologians, of which Walter Kasper, Karl Lehmann and Joseph Ratzinger were members. See Barbara Schwahn, Der Ökumenische Arbeitskreis Evangelischer und Katholischer Theologen von 1946 bis 1975 (The Ecumenical Working Group of Protestant and Catholic theologians from 1964 to 1975), Vandenhoeck and Ruprecht, 1996, p. 41. In 1957, Jaeger founded the Johann Adam Möhler Institute for Ecumenism. Throughout Pius XII’s pontificate, Fr. Augustin Bea, SJ, acted as the link between all the German ecumenical groups and the Vatican. 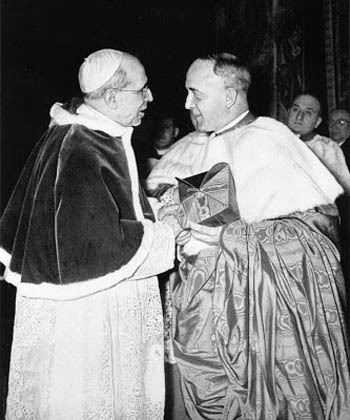 With Bea’s express encouragement, Archbishop Jaeger wrote to Pope John XXIII in March 1960 requesting a group of “experts” to be formally set up in the Vatican to advise on ecumenical questions. Three months later, the Pope established a Secretariat for Promoting Christian Unity as one of the preparatory commissions for the Council, and appointed Bea (whom he had recently made a Cardinal) as its first President. 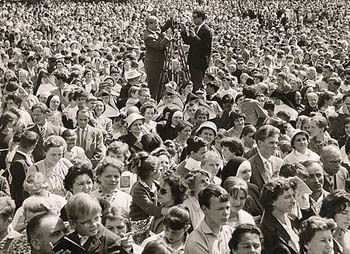 Derrick,“The Eucharistic Congress at Munich,” The Tablet, August 20, 1960. Fr. Karrer was a disciple of the medieval mystic, Meister Eckhart and also an admirer of Card. John Newman whom he regarded as one of the fathers of modern theology. In 1922, he produced a German version of Newman’s works. His influence on the ecumenical theology of Vatican II was considerable. What a world of difference lies between Karrer and his fellow Jesuit, St. Peter Canisius, who led the Jesuit Counter-Reformation in Germany against the Protestants of the 16th century! Victor Conzemius, Otto Karrer (1888-1976), Publications de l'École Française de Rome, 1989, vol. 113, n. 1, p. 351. O. Karrer, ‘Die Eucharistie im Gespräch der Konfessionen, Vortrag 6. 8. 1960 beim Eucharistischen Weltkongress München’ (The Eucharist in Dialogue with Religions: a lecture given on August 6, 1960, at the International Eucharistic Congress in Munich) in Una Sancta 15, 1960, pp. 229-250. Victor Conzemius, Otto Karrer (1888-1976), p. 351. It is true that in Munich Eucharistic processions, sponsored by the Dukes of Bavaria, were traditionally accompanied by the sound of church bells, drums, trumpets and gunfire from muskets and cannon. (See Alois Mitterwieser, Geschichte der Fronleichnamsprozession in Bayern, Verlag Knorr und Hirth GmbH, Munich, 1930, pp. 34-37) But this was done to salute the Royalty of Christ the King and to emphasize the combative spirit needed to defend the true Faith. Franz Xaver Bischof, München als Treffpunkt der Kirche: Der 37. Eucharistische Weltkongress 1960 (Munich as the Meeting Place of the Church: The 37th International Eucharistic Congress 1960), Münchener Theologische Zeitschrift (The Munich Theological Journal) , 62 (2011), p. 106. Jungmann did not succeed in entirely eliminating Eucharistic processions, even at the Munich Congress. On that occasion, the procession of the Blessed Sacrament was led by the papal legate, Card. Gustavo Testa. Also, Corpus Christi, called “Fronleichnam” in German, is still a public holiday in Bavaria and has for centuries been a cherished institution in its own right. It was always a magnificent spectacle, with the people taking part in the procession dressed in traditional costumes to honor the Blessed Sacrament. XXIII, Animo praesentes, August 7, 1960, Acta Apostolicae Sedis, 1960, p. 774. Meeting with the Parish Priests and the Clergy of the Diocese of Rome, Address of His Holiness Benedict XVI, Hall of Blessings, Thursday, February 7, 2008. Joseph Ratzinger, Milestones: Memoirs 1927-1977, Ignatius Press, 1998, p. 148.